The iPhone XS Max and Galaxy Note 9 are the best and most expensive smartphone offerings from Apple and Samsung. They both cater to the same ultra-premium segment, and we have seen all kinds of iPhone XS Max vs Galaxy Note 9 comparisons. Now folks at PhoneBuff have conducted a thorough iPhone XS Max vs Galaxy Note 9 speed test to find out which device is faster and more powerful. The speed test involves launching a series of apps in quick succession on both devices and then reopening them all in reverse order. In the first round, the processing power and software integration play a major role while the second round is primarily about RAM management of each device. Of course, it’s not as scientific as benchmark tests but PhoneBuff has tried to eliminate the chances of human error by using a robotic arm holding a stylus. Apple’s latest iOS 12 software focuses on performance and stability. Users have noticed that apps load faster on iOS 12 than on iOS 11 on the same device. The Note 9 runs a customized version of Android Oreo. The iPhone XS Max gets 4GB RAM, which is only half as much as the Note 9. Apple’s flagship runs the A12 Bionic chipset, which is the world’s first processor based on the 7nm manufacturing technology. It is faster and more energy efficient than last year’s A11. The Galaxy Note 9 runs Qualcomm’s Snapdragon 845 SoC based on the 10nm process. The XS Max also has fewer pixels to power than its rival. In PhoneBuff’s Galaxy Note 8 vs iPhone 8 Plus speed test last year, the Note 8 significantly outperformed the iPhone. The iPhone 8 Plus’s performance was restricted due to just 3GB RAM. A lower RAM meant it had to reload each app in the second round. The higher RAM on the Note 8 allowed it to fetch them from memory without having to load them all over again. 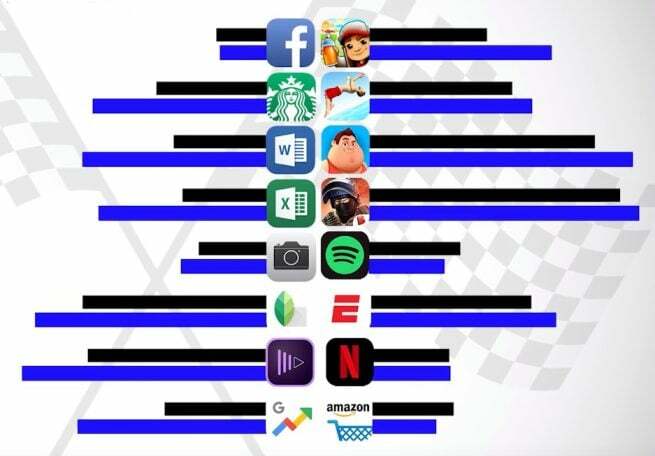 In the first round, the iPhone XS Max took 1 minute and 49 seconds to open all 16 apps including Facebook, Starbucks, Amazon, Netflix, camera, Word, and a bunch of games. These are the apps that people use on a daily basis. The Note 9 took 2 minutes and 11 seconds to finish the same task. In the second round, the extra RAM on the Note 9 comes to its rescue. It relaunched the same apps in just 35 seconds compared to 43 seconds for the XS Max. The 4GB RAM inside the XS Max also allowed it to keep all apps in memory in the second round except Starbucks. 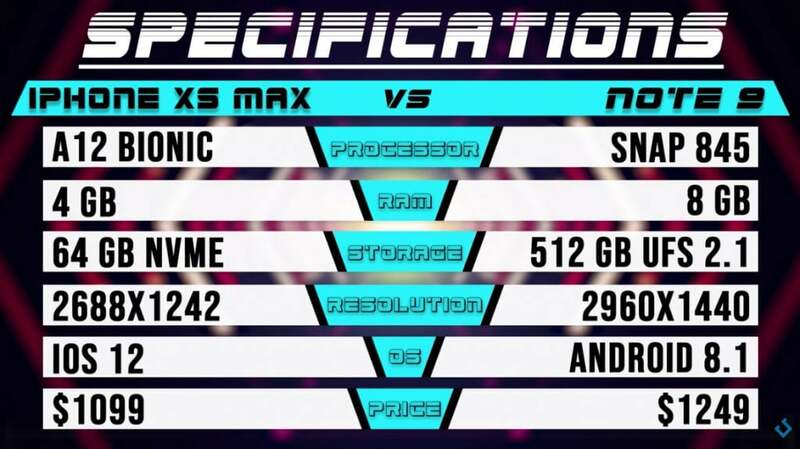 Overall, the iPhone XS Max finished 14 seconds faster than its rival despite sporting only half the RAM. Also, the XS Max was able to load every single app faster than Note 9 except Facebook and Spotify. The credit for its spectacular performance goes to the A12 Bionic chip and the iOS 12 software. This iPhone XS Max vs Galaxy Note 9 comparison is certainly better than the claims made by smartphone vendors (up to 30% faster, up to 15% better, etc). Apple claims the A12 chip delivers a 15% performance boost over the A11 Bionic processor. Samsung needs to up its game with the upcoming Galaxy S10 to catch up with the XS Max, which will be more than six months old by the time the S10 comes out. The S10 will also reportedly run a 7nm chipset, so we can expect a significant performance boost. The XS Max has also outperformed the Galaxy Note 9 in benchmark tests. Earlier this month, folks at Tom’s Guide ran the latest iPhones and flagship Android devices through the Geekbench 4 benchmark to assess their performance. The XS Max came out at the top with 11,515 points in multi-core tests. It was closely followed by iPhone XS with 11,420 points and last year’s iPhone X with 10,357 points. The Galaxy Note 9 lagged far behind with 8,876 points, even behind OnePlus 6. The XS Max costs $1,099 for the cheapest model and $1,449 for the most expensive variant. The Galaxy Note 9 starts at $1,000 for the 6GB RAM/256GB storage variant and $1,250 for the 8GB RAM/512GB storage model.